After the terrible conflagration of Ragnarok, the earth rises serenely again from the ocean, and life is renewed. The Poetic Edda begins with The Seeress's Prophecy which recounts the creation of the world, and looks forward to its destruction and rebirth. In this great collection of Norse-Icelandic mythological and heroic poetry, the exploits of gods and humans are related. The one-eyed Odin, red-bearded Thor, Loki the trickster, the lovely goddesses and the giants who are their enemies walk beside the heroic Helgi, Sigurd the Dragon-Slayer, Brynhild the shield-maiden, and the implacable Gudrun. New in this revised translation are the quest-poem The Lay of Svipdag and The Waking of Angantyr, in which a girl faces down her dead father to retrieve his sword. 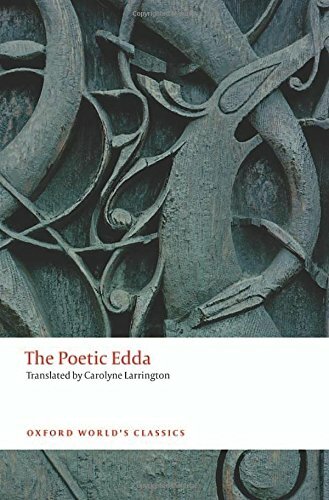 Comic, tragic, instructive, grandiose, witty and profound, the poems of the Edda have influenced artists from Wagner to Tolkien and a new generation of video-game and film makers. ABOUT THE SERIES: For over 100 years Oxford World's Classics has made available the widest range of literature from around the globe. Each affordable volume reflects Oxford's commitment to scholarship, providing the most accurate text plus a wealth of other valuable features, including expert introductions by leading authorities, helpful notes to clarify the text, up-to-date bibliographies for further study, and much more.